But one thing is certain, like all channels of self-improvement advice, books on happiness echo pretty much the same exact advice over and over again in a thousand different ways. So today I figured I’d eliminate the fluff and give you a list of the 30 traits most happy people have in common, according to every book I’ve ever read on happiness. Bottom line: You can be happy – you can choose happiness. And you don’t even need to develop all 30 of these traits to get there. Start with one of them that you know you struggle with. Work on just that one point until you have it mastered, and then move on to another one. Gradually, you’ll discover yourself becoming a better version of YOU – and that by itself is something worth smiling about. Practical and inspiring! Lots of great advice packed into this short post. Thanks guys! Good advice… every point. Thank you. Number 5 is so very important. If you aren’t asking the right questions, you are excepting the wrong answers as a way of living. Thanks for sharing, now I know why I smile at my problems. And this has motivated me to smile some more. Thank you so much for this. Reading this was a much needed inspiration! This is an awesome blog, thank you so much for sharing all this wonderful and inspirational knowledge! Great list to start the week off with! Great list, and I would add a couple more. We have the ability to be grateful and to share that gratitude with others. We also build the practice of sincere apology and forgiveness into our lives. If we hold onto grudges, we will never find our way to happiness. That’s a pretty comprehensive list! I would submit that no one practices all 30 of these ideals perfectly, and that you don’t have to in order to be happy. Happiness is not so much a destination (“I’ve arrived”) as it is a journey. 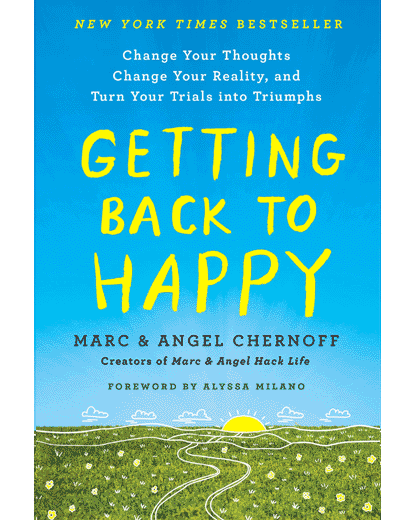 Thanks, Marc and Angel, for consistently providing thought-provoking material on living the best life. Happy people just live a longer and fruitful life based on the choices they make every day. And Marc And Angel, with people like you in our lives giving us the great direction to find this happiness, along with God’s help, means more of us will find happiness in life. Happy to have read this today!! Wonderful post. An inspiring reminder to choose to be happy! I’ve also read a number of “happiness” books over the years in search of some magical nugget of wisdom that would propel me into a heightened state of consciousness. It wasn’t until I stopped searching and started living that I began to recognize that I was already there. Well, almost. It was interesting to see how many of these principles I align myself with, and how the few that I neglect really do seem to affect my wellbeing. Although I agree that everyone must start somewhere, it’s become even more apparent how critical each and every one of these principles are to living a truly peaceful life. Amazing post & sums up happiness traits well! I love the journey and I love the 30 things list… inspiring and keeps me wanting to stay happy. Top notch advice, seriously guys. Thank you. I’m gettin’ on with it now! These are so very true! I have found reading your posts wonderful use of my time off. They have enriched my life and helped me in this journey I can life! Thanks! I sometimes wonder if we focus on happiness too much though. There is a book called Bright-Sided, you may have heard of. It came out a couple years ago and it focused on the problems that stem from our marketing of happiness as a constant goal. I am from Argentina… I am very grateful for your blog, giving to the world inspirations thinking for a better world,if we learn this principles we must to share it with the others. thanks thanks. Thanks for the smile, it always feels so good! Great list. I will pass this list on to people and hope they do as you say, take a point, work on it and then move on to the next! This is an excellent list. It’s great to see myself in even a few of these traits and find others in the list that remind me of what I can focus on developing further. Thanks! This is excellent. I have passed it on and hopefully it will strike some cords with those that are having a difficult time. Thank you for sharing. It’s amazing how I can relate to most of the sentences of this post. I guess everyone who reads the posts in this site feels the same way. Thanks Marc. Sometimes in life, we have friends whom we don’t see or meet, but yet, love dearly from the core of the heart. YOU are one of them. This was a wonderful read. Not only inspiring, yet gave me some ideas to fill in the gaps to bring my happiness from 85% to 99.9%. I have quoted your emails in the past on my blog. And I have finally made the time to thank you for such uplifting and heart warming inspiration! Needless to say… I will be making sure to quote your gold more often! What a great inspiring read. I really need to turn that off switch on. Thanks for sharing this wonderful list. It’s a must share. #31…EVERYTHING IN LIFE YOU SHOULD LOVE IT- LOVE IT – LOVE IT, OR CHANGE IT, AND IF IT DOESN’T CHANGE, LEAVE IT! This is a great article, but I have to disagree with #28. I’m a firefighter and what I do is a calling, not a job. I’m blessed to have my position and get paid for what I love to do. It is who I am and relates directly to my values. Otherwise, great list and I found a lot of it reflective of my life. Paul H: I think the point is that if something happened tomorrow and you could not be a Firefighter anymore, it would not strip away the identity of who you are as a human being. Who you are as a human being is a selfless person who is willing to risk your life to save others, not a Firefighter. This is the story of my life! So true!